The play on the third day began 121 minutes after the scheduled start of play. The West Indies team led by Brian Lara toured Africa in 2003/04 for full-length bilateral series against Zimbabwe and South Africa. Windies first faced Zimbabwe in two-match Test series which was followed by a five ODIs. The hosts elected to bat in the first Test hosted by Harare that began on November 4th. Zimbabwe were three down for 58 and were further 154/5 into the second session. Middle-order batsmen showed some fight as Craig Wishart and Stuart Matsikenyeri scored 47 and 57 respectively. Tatenda Taibu’s unbeaten 75 helped Zimbabwe to finish the first day on 284/6. He added only ten runs to his overnight total before getting out but skipper Heath Streak (127*) handled the Windies bowlers along with Andy Blignaut (91). The pair added 168 for the 8th wicket to help Zimbabwe finish on 507/7. West Indies ended the day on 11/0 before 36 minutes were lost due to bad light. The third day’s play was set to begin half an hour early (9:30 am local time) to make up for the lost time on the 2nd day. The players were warming up just before the scheduled start while the ground staff were rolling the pitch. During this time, Zimbabwe’s Trevor Gripper hit a practice ball straight on to the pitch where the roller was doing its job. The operator rolled it over the ball that produced a dent in the pitch. The hole was about an inch deep at short of a length to a left-hander from the City (southern) end of the ground. The dent could be dangerous as the ball pitching on it could fly anywhere. 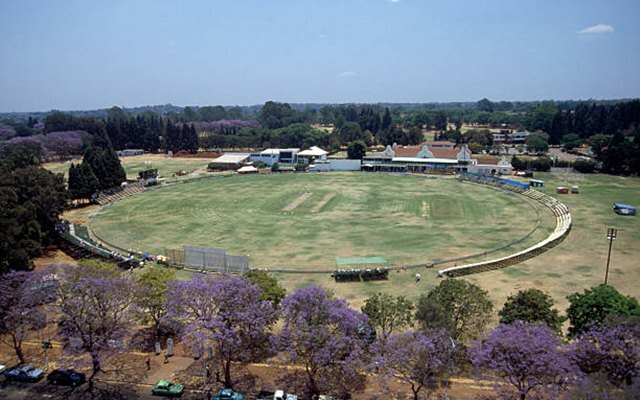 Fortunately for the ground staff, there was the Royal Harare Golf Club adjoining the ground. They borrowed an auger from the golf course to replace the damaged portion on the pitch. Robin Brown, the HSC groundsman and a former Zimbabwe opener was in charge of operations. He first tried to replace the dent with the portion of the pitch behind the stumps as it will be hard and drier than anything from the golf course. The process turned out to be successful and cleaned up the area to make the pitch look like how it was at first place. After an inspection, the match referee Gundappa Viswanath gave the green signal for the play so did the West Indian captain Brian Lara. The play on the third day began 121 minutes after the scheduled start of play. Wavell Hinds and Daren Ganga made 79 and 73 respectively as Windies moved well at 179/2. However, a six-wicket haul for Ray Price saw the Caribbean side collapse to 335 and concede a 172-run first innings lead. Zimbabwe made efforts to score quickly as they were reduced to 94/4 by end of the fourth day’s play. They added 106 runs in the 21 overs on the final day morning to set a target of 372 in 83 overs for the visiting side. Price once again troubled the West Indians who were three down for 38 in 15 overs. They were further reduced to 103/5 with another 44.2 overs left in the game. Shivnarine Chanderpaul and Ridley Jacobs added 68 runs for the 6th wicket but more importantly, the duo batted out 20.5 overs. 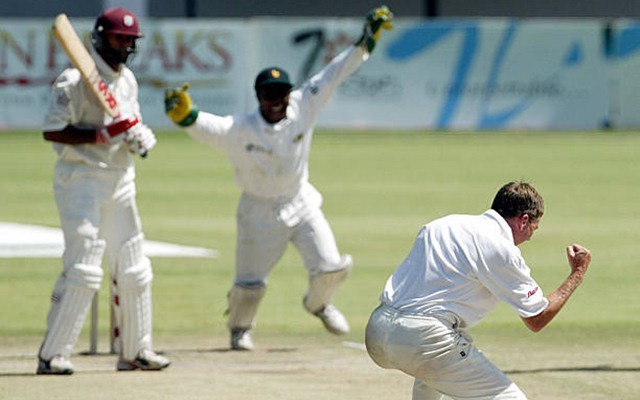 Chanderpaul was dismissed on 39 and three more wickets followed him. The Windies stood at 204/9 with another 11.5 overs to go. Jacobs, with an unbeaten 60 off 139 deliveries, stood 181 minutes at the crease to save the Test with the No.11 Fidel Edwards who faced 32 balls for his one run. After holding on a thrilling draw, the Windies sealed the Test series by defeating the hosts in the final Test in Bulawayo by 128 runs. The five-match ODI series was also a closely contested one which was also won by the visiting side. In the series decider, Chris Gayle struck an unbeaten 75-ball 112 after claiming a four-wicket haul.